As mentioned in a previous post, Nathalie Kosciusko-Morizet and other green party activists were trying to get motorcycles and cars manufactured before 2004 banned from city centres in France. Luckily, Ms. Kosciusko-Morizet has now moved on and her replacement, Delphine Batho, under the immense pressure of the very famous and well respected French Federation of Angry Bikers (FFMC – Fédération Française des Motards en Colère), has decided to put an end to her predecessor’s ludicrous proposals. Bikers, however, are never fully protected from legislators who keep trying to push through such invasive laws, whether in France or the United Kingdom. A part of our argument against motorbikes and scooters being accused to be environmentally unfriendly needs to be that there’s not much conclusive evidence that motorcycles are actually more detrimental to the environment than cars manufactured after 2004 are. 1. Motorcycles are considerably more fuel efficient than most cars. For instance, the average 100cc commuter motorcycle gets over a hundred miles per gallon (mpg). Even a supersport motorcycle, which isn’t designed to be fuel-efficient gets around 40 mpg, which is around as many mpg as many cars that are considered outstandingly eco-friendly get. 2. Fewer natural resources are required to produce a motorcycle than are required to produce other types of vehicles. Think about it. Even the biggest motorcycle requires fewer parts to make than small cars require. 3. Motorcycles create less carbon dioxide than cars because they burn fuel more efficiently. Since carbon dioxide emissions could be argued to be the primary cause of global warming, this is significant. Some will assert that motorcycles produce more smog pollutants than cars, which is often true. However, the addition of catalytic converters to motorcycles solves this problem. Since the 1990s, an increasing number of motorcycles have been built with catalytic converters, which convert carbon monoxide, nitrogen oxides, and hydrocarbons into carbon dioxide, water, and nitrogen and thus allow motorcycles to contribute less to air pollution. The eco-friendly perks of motorcycles mentioned above are just some of the reasons anti-motorcycle legislation lacks credence. We need to have a serious discussion about the impact of a motorcycle ban like the one that was proposed by Nathalie Kosciusko-Morizet, and lawmakers need to listen to our side of the story. 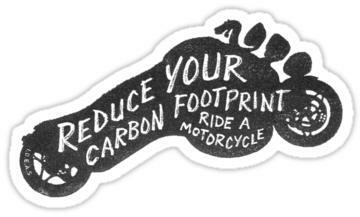 Motorcycles definitely have a carbon footprint, but so do all motorised vehicles. The nickel batteries used in many hybrid cars, for instance, have an incredibly detrimental effect on the environment. To produce hybrid car batteries, nickel first has to be harvested (which takes a toll on the environment), and then that nickel has to be sent to refineries and manufacturers around the world to be turned into a battery. Once a nickel battery ends up in a landfill after years of use, the damage it does to the environment continues. There’s no way around it. Using any kind of vehicle isn’t necessarily eco-friendly. As responsible motorcyclists, we need to figure out ways to reduce the environmental impact of how we get around. This could mean riding our motorcycles less and walking more often, for instance. Still, we depend on our motorbikes to get us to work and for enjoyment. There’s nothing better than riding up on your motorcycle to your favorite café in the city centre on a beautiful night. Politicians shouldn’t deny us that pleasure. They should, instead, be focused on helping manufacturers figure out ways to craft more environmentally-friendly motorcycles to provide motorbike riders with more sustainable options in the future. Stacy Holmes is a motorbike enthusiast, mother, and freelance writer for motorcycleinsurance.com and other motorcycle sites and blogs. When she’s not riding around on her Sportster, Stacy likes to spend her time writing about her adventures on the open road. What Stacey fails to add is the fact that a car spends considerably longer stationary in a city. Achieving zero kilometres per litre of fuel but still putting emissions into the atmosphere. A motorcycle spends more time moving in heavy traffic. A considerable benefit to reduce congestion and emissions. Motorcycles are generally NOT fuel efficient, they use less fuel than cars per kilometre travelled, but in terms of energy use per work unit done are not as efficient as most modern cars. That said, keep on biking!